Update - [March 17, 2008] see a photoessay on St. Patrick's Day 2008 here. 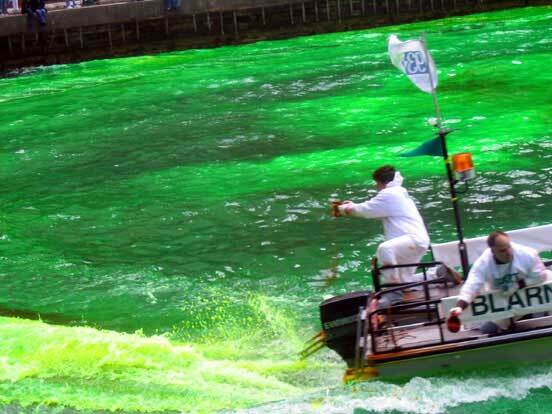 Every year since 1962, the Chicago River has been dyed green to celebrate St. Patrick's day. Nowadays, both the dyeing and a big parade take place the Saturday before the 17th. (Next year, they'll coincide when the 17th falls on a Saturday.) 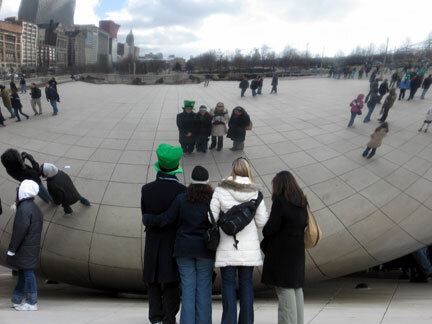 It's a uniquely Chicago tradition that tips its hat to the central role the Irish have played in the city's history. 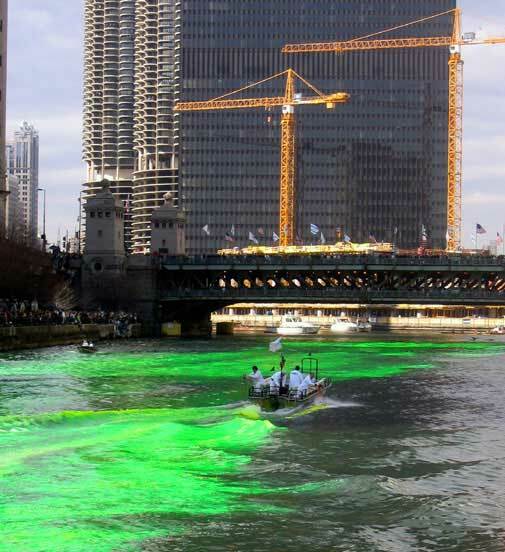 For a few hours every year, the architectural landmarks that line the Chicago River acquire an aquatic front yard that's as vibrant as the neon green relish of a genuine Chicago hot dog. The actual dye is orange. It turns green when it's churned into the water. 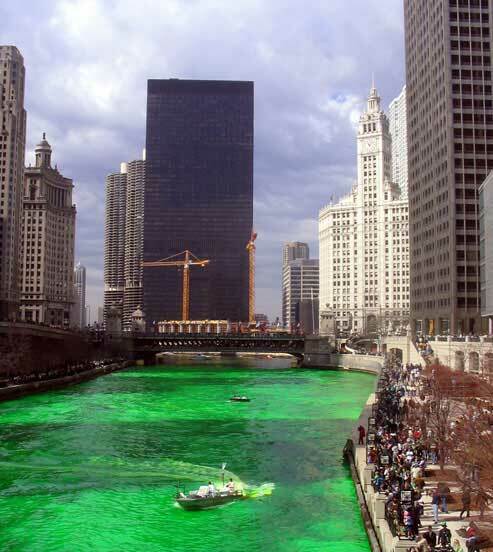 The discovery of this phenomenom was made by members of Chicago's pipefitters union back in 1962, and the union has been dyeing the river for St. Pat's ever since. 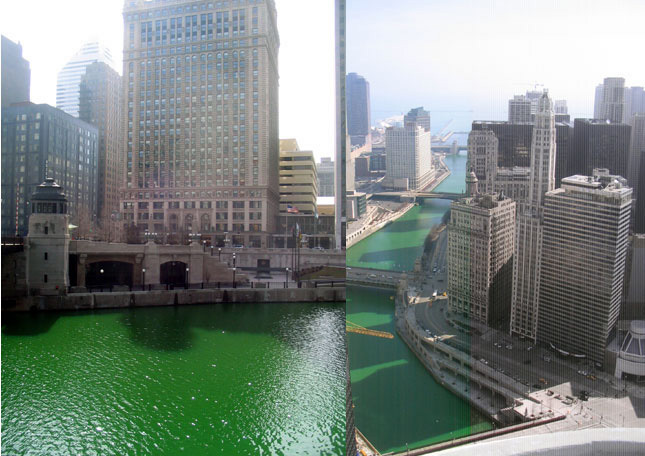 The natural green of the river can be seen to the right, awaiting its transformation into the hypergreen to the left. 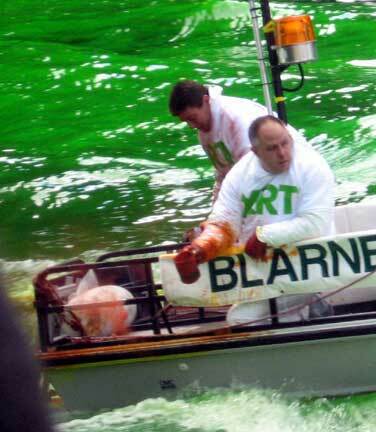 Each year, thousands line the banks of the Chicago River to see it turn green. Late in the afternoon, hundreds of tea-toddlers line the city's sidewalks to see the bar-hoppers turn green. For a few hours each year, an emerald carpet spreads out before some of Chicago's most prominent architectural landmarks. From the left: the London Guaranty Building (with cupola), the twin towers of Bertrand Goldberg's Marina City, Mies van der Rohe's IBM Building, the cream color terra cotta of the Wrigley Building, and Skidmore, Owings Merill Equitable Building. The tall crane marks the construction site for Trump Tower. 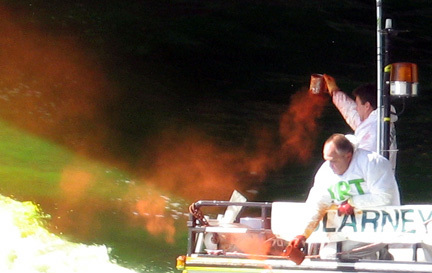 In 1962, over 100 pounds of dye were dumped into the river, leaving it green for days. 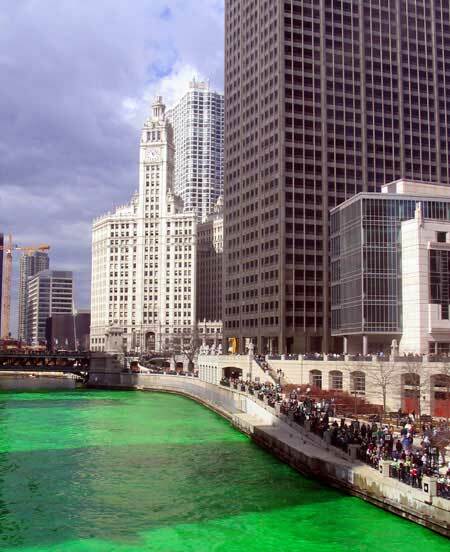 Now, only 40 pounds are dispersed, but because the river was reversed to run backwards away from the lake, even one day later, the entire river for many blocks to the west remains a single shamrock-colored fairway. 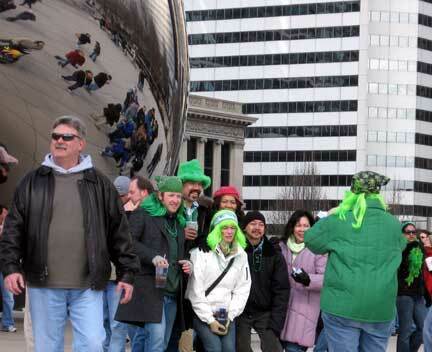 Chicago's mania for St. Patrick's green is pervasive. 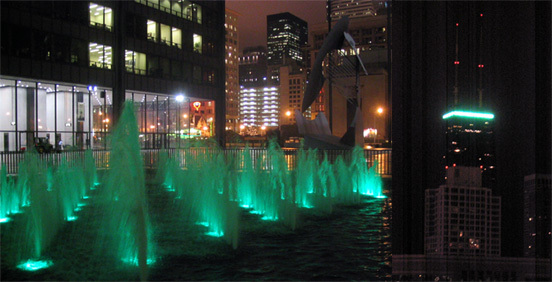 To the left is the fountain in Daley Plaza; to the right, the lighted crest of the John Hancock Building. 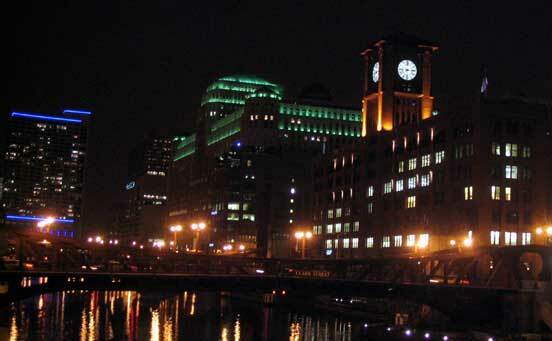 Even the two-block square Merchandise Mart goes green for St. Patricks. To the left is Riverbend, to the right the Reid Murdoch Building and clock tower. 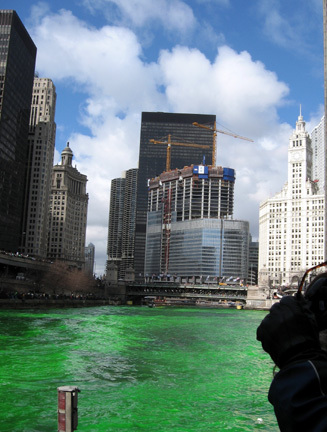 Trump Tower, under construction, begins to claim its spot at the foot of the green river. 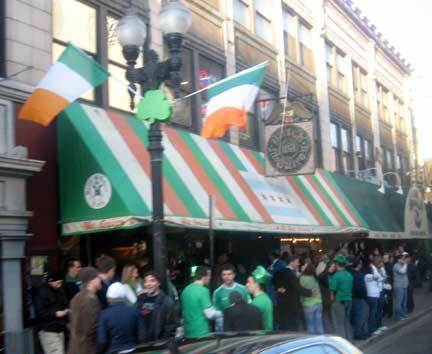 Butch McGuire may be gone, but his namesake Division Street bar still packs them in for St. Patrick's day. 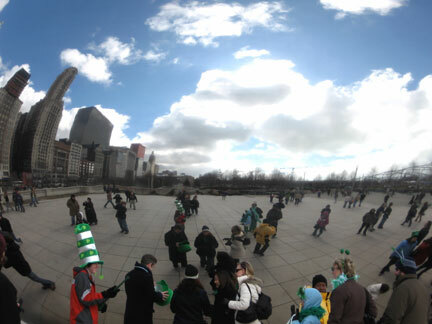 St. Patrick's Day at Anish Kapoor's Cloud Gate sculpture, popularly known as Da Bean, at Millennium Park. © Copyright 2006 Lynn Becker All rights reserved.